Early American U.S. 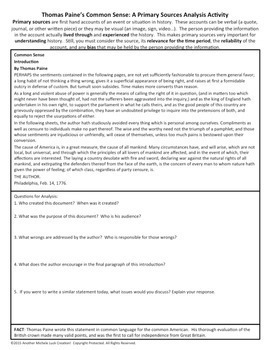 Document Primary Source Analysis BUNDLED SET! 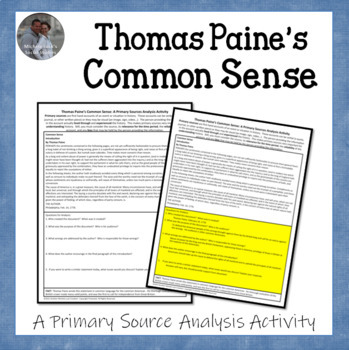 This 1-page handout provides the Introduction to Thomas Paine's Common Sense leading to the American Revolution followed by guiding questions for students to use in analysis. 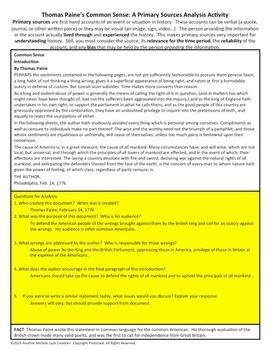 Includes a significance wrap-up question in which students utilize all of the information to explain the significance of the document or its relevance to American History. All images and other primary sources collected from Library of Congress, National Archives or public domain. See preview for actual product. Great class or homework assignment! See other Primary Source Analysis Activities in my TpT Store! Please visit my TpT Store for other great Social Studies, ELA, and New Teacher Resources. Walking Tours through History, Archeological Digs, Bio Card Activities, Game Card Sets, Scavenger Hunts, Centers & Stations Activities, Interactive Lectures, Analysis Assignments, Student Review Materials, Role-Card Activities, Human Board Game Sets, & so much more!